you that it has been before. We're getting into fixture congestion time. Match number four of eight in a progression from Saturday to Wednesday to Sunday to Wednesday to Monday to Saturday to Tuesday to Saturday; maybe there'll be a ninth if the cup tie comes back to London. Games like this one, QPR away with a huge FA Cup tie on the horizon, are trap games. Arsenal have lost some trap games like this one before. For example, in 2012, when they lost 2-1 at Loftus Road. Arsenal, trying to close that famous gap on Tottenham, had won seven straight in the league before that match. The very first thing I said in that match's preview? "I'm not going to lie; this game worries me..."
Arsenal are still in third after this weekend's fixtures and are starting to talk a little bit about catching City for second. You can't take your eyes off that prize for a second, especially on the road against a relegation candidate. Huge three points on the table, no doubt about it. to suspend the ball in midair. The trickiest situation, however, is in defensive midfield after Francis Coquelin had to be removed from Sunday's match with a broken nose. If he's able to start, he will likely be wearing a protective mask that will hopefully look really, really badass. Meanwhile, Aaron Ramsey could be back in contention as he has been back in full training since last week. I didn't get the chance to talk about this in last weekend's preview, but Jack Wilshere has had what appears to be a minor setback (of course he has.) As Arsene Wenger put it, he needed "a little surgery." A little surgery? How do you have a little surgery? That's the Arsenal-ist way of putting that I could imagine. Mathieu Flamini is still out after suffering a setback of his own (of course he has,) meaning that if Ramsey and Coquelin can't go, then Calum Chambers might have to start in the deep-lying midfield role. Perhaps Tomas Rosicky can be deployed as a little bit of protection as well, though obviously he'd be a little more advanced positionally. Up top, Alexis Sanchez has looked a bit jaded as of late, so we'll likely get a good amount of rotation in the attacking midfield. Then again, perhaps Wenger will ask Sanchez if he wants the day off, at which point Alexis will write his own name into the starting XI. Elsewhere, maybe we'll be able to get Santi Cazorla a rest too ahead of a big trip to Old Trafford on Monday. I'm not sure about Alex Oxlade-Chamberlain, as he is himself just returning from a long layoff. Predicted XI: Ospina, Bellerin, Gabriel, Koscielny, Monreal, Coquelin, Rosicky, Ozil, Welbeck, Walcott, Giroud. 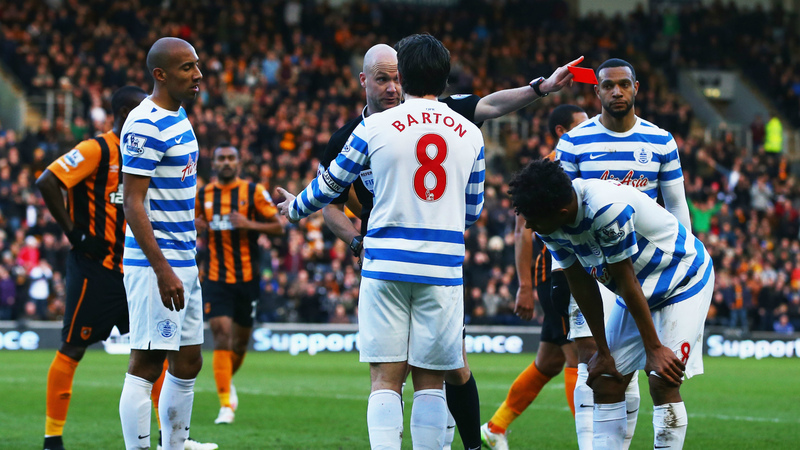 Joey Barton is shown getting sent off in QPR's last match. This might be the best thing Anthony Taylor has done all year. Sandro, the Brazilian midfielder signed from Tottenham at the summer deadline, could make his first appearance for QPR since late November; he's been dealing with a knee injury but, if he passes fit, he could start in place of the suspended Joey Barton. Elsewhere in the middle, there are doubts over another ex-Spur, Niko Kranjcar, who picked up a knock and was removed on 78 minutes from QPR's last match against Hull the weekend before last. There will also be late fitness tests for Mauricio Isla and Nedum Onuoha. Adel Taarabt (how many former Tottenham players does this team have?!) is suffering through a bit of a lost season and is expected to miss this match with a groin injury; the Moroccan has made only five appearances for QPR this year. He's also been hampered by illness and a groin injury this season but in October, Harry Redknapp accused Taarabt of being overweight and unwilling to train. The Hoops have three players out with long-term knee injuries in Leroy Fer, Richard Dunne, and Alejandro Faurlin. Predicted XI: Green, Suk-Young, Caulker, Ferdinand, Furlong, Phillips, Kranjcar, Henry, Traore, Zamora, Austin. Arsenal are suddenly scoring from corners regularly. The roller coaster that is Arsenal's form continues to roll on as the Gunners followed up their poor Champions League showing with a clean sheet victory; Arsenal have now won 16 of their last 21 across all competitions, but those five dropped games (at Stoke, at Liverpool, at Southampton, at Spurs, and last Wednesday vs. Monaco) all stung in different ways. Still, Arsenal were eighth in the league after they lost to Manchester United in November and are now in third. QPR finally earned a point on the road with a 2-0 win over Sunderland on February 10; it is their only win in their last 10 across all competitions. The Hoops' home form has helped them just enough, though, as they are out of the relegation zone on goal difference. It took Manchester United a long time to finally break QPR down at Loftus Road, it took a bonkers finish for Liverpool to come away with all three points, while Manchester City could only salvage a draw. QPR's road form is rock bottom, but they are 12th in the league at home. Arsenal won the reverse fixture on Boxing Day by a 2-1 scoreline. Despite Alexis Sanchez's early penalty that was saved, the Gunners were leading comfortably for much of the way; Sanchez made up for the poor penalty by scoring the opener. 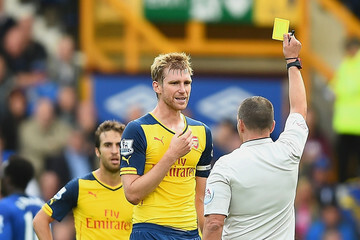 On 53 minutes, however, a moment of madness from Olivier Giroud saw him sent off for a headbutt. Tomas Rosicky doubled the lead for ten man Arsenal, but a dubious penalty brought QPR back into the match on 79 minutes. The final quarter of an hour played out nervously for the Gunners, but ultimately saw the home side take all three points. The last time this fixture was played, in early May of 2013, Theo Walcott opened the scoring just 20 seconds into the match. That was all that happened, as Arsenal held on for 90 minutes to win 1-0. That was Arsenal's first league win at Loftus Road since November 24, 1990. 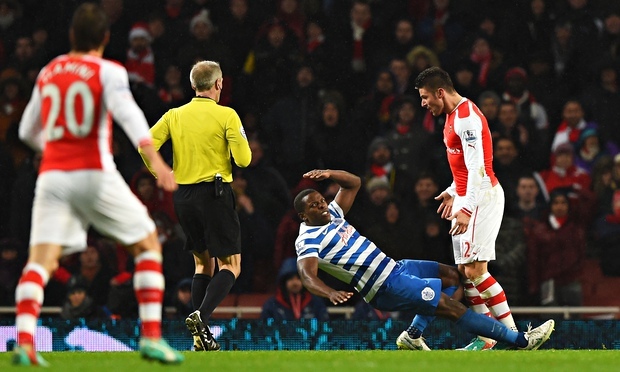 Over their last 15 league meetings, Arsenal have just five wins against QPR. This stat is largely meaningless since prior to the two seasons QPR spent in the top flight between 2011 and 2013, the club had not been in the Premier League since their relegation in 1996. The Gunners have won three straight meetings between the two teams and four the of last five since QPR's 2011 promotion and subsequent yo-yoing. against Everton back in August. The referee is Leicestershire-based Kevin Friend. Arsenal have seen Friend twice this year, for the 2-2 draw at Everton in August and the 2-0 win at Sunderland in October. Many of Friend's calls in that first match felt like they went against Arsenal (more like Kevin Enemy, amirite?) 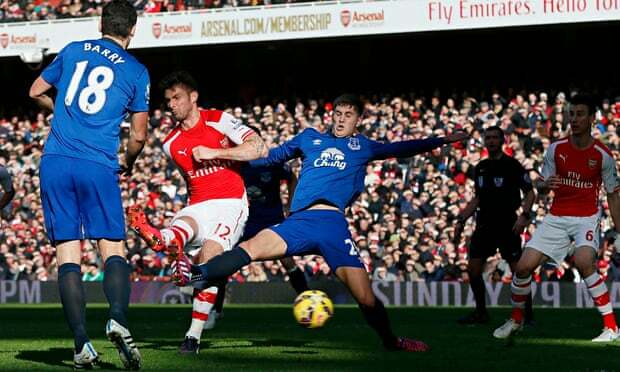 Four different Arsenal players were booked to Everton's one, while Arsenal were whistled for 18 fouls to Everton's 10. Arsenal's comeback, however, and subsequent win in October means they still have not lost a match with Friend as the referee, with five wins and three draws over eight matches. As for QPR, they have seen Friend only once this season, for a 2-0 loss at Swansea in early December. His last match at Loftus Road was a 1-1 draw with Millwall in a London derby late last season in the Championship. Friend was recently in charge of the Southampton v. Liverpool match in which he denied the Saints two penalty shouts within the early potion of the game, though only the second of the two appeared to be legitimate on replay. He later failed to send off Simon Mignolet when he appeared to intentionally handle outside of the box. John Painting is a contributing writer to The Modern Gooner and a type of shortwave radio station characterized by unusual broadcasts of lists of numbers, which are widely assumed to transmit covert messages to spies. You can follow him on Twitter @zorrocat to find out 9-4-6 4-6-5-8-7-3-3 3-4-2-2-9.